FlyBook V33i is a ultra-portable laptop computer from Dialogue, a Taiwanese manufacturer. Dialogue FlyBook V33i features Intel Pentium-Mobility (Dothan) ULV 1.1 GHz processor, DDR1 memory, ATI RC410 core logic, ATI SB450 chipset, 8.9″ 1024 x 600 (WSVGA 32-bit) high resolutions 16:9 wide-view Color LTPS TFT LCD display, landscape and portrait dual mode LCD overlaid touch panel, swivel hinge, external DVD optical drive, Gigabit LAN support, built-in (AC97) speakers, built-in microphone, USB 2.0, 1394 Firewire, PCMCIA Type-II slot, GPRS wireless data connection with internal slot for SIM card, optional 3.5G W-WAN (HSDPA/UMTS/EDGE/GPRS/GSM), or 2.75G W-WAN (EDGE/GPRS/GSM) and runs on Microsoft Windows XP Home or Pro Edition. 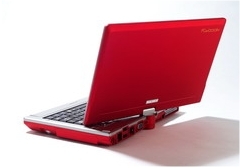 FlyBook V33i available in red or black color. The Independent reviews Dialogue FlyBook V33i and concludes that a few drawbacks such as no Microsoft’s well-regarded OneNote software for tablet PCs and lack of documentations, and the absence of a CD or DVD drive, make it hard to recommend the Flybook. It is pleasant to use but a good, full-sized tablet PC will be more flexible and powerful and should not have compatibility issues.